For other uses, see Dictionary (disambiguation). A dictionary is a collection of words in one or more specific languages, often arranged alphabetically (or by radical and stroke for ideographic languages), which may include information on definitions, usage, etymologies, phonetics, pronunciations, translation, etc. or a book of words in one language with their equivalents in another, sometimes known as a lexicon. It is a lexicographical product which shows inter-relationships among the data. A broad distinction is made between general and specialized dictionaries. Specialized dictionaries include words in specialist fields, rather than a complete range of words in the language. Lexical items that describe concepts in specific fields are usually called terms instead of words, although there is no consensus whether lexicology and terminology are two different fields of study. In theory, general dictionaries are supposed to be semasiological, mapping word to definition, while specialized dictionaries are supposed to be onomasiological, first identifying concepts and then establishing the terms used to designate them. In practice, the two approaches are used for both types. There are other types of dictionaries that do not fit neatly into the above distinction, for instance bilingual (translation) dictionaries, dictionaries of synonyms (thesauri), and rhyming dictionaries. The word dictionary (unqualified) is usually understood to refer to a general purpose monolingual dictionary. There is also a contrast between prescriptive or descriptive dictionaries; the former reflect what is seen as correct use of the language while the latter reflect recorded actual use. Stylistic indications (e.g. "informal" or "vulgar") in many modern dictionaries are also considered by some to be less than objectively descriptive. A multi-volume Latin dictionary by Egidio Forcellini. Although the first recorded dictionaries date back to Sumerian times (these were bilingual dictionaries), the systematic study of dictionaries as objects of scientific interest themselves is a 20th-century enterprise, called lexicography, and largely initiated by Ladislav Zgusta. The birth of the new discipline was not without controversy, the practical dictionary-makers being sometimes accused by others of "astonishing" lack of method and critical-self reflection. The oldest known dictionaries were Akkadian Empire cuneiform tablets with bilingual Sumerian–Akkadian wordlists, discovered in Ebla (modern Syria) and dated roughly 2300 BCE. The early 2nd millennium BCE Urra=hubullu glossary is the canonical Babylonian version of such bilingual Sumerian wordlists. A Chinese dictionary, the c. 3rd century BCE Erya, was the earliest surviving monolingual dictionary; although some sources cite the c. 800 BCE Shizhoupian as a "dictionary", modern scholarship considers it a calligraphic compendium of Chinese characters from Zhou dynasty bronzes. Philitas of Cos (fl. 4th century BCE) wrote a pioneering vocabulary Disorderly Words (Ἄτακτοι γλῶσσαι, Átaktoi glôssai) which explained the meanings of rare Homeric and other literary words, words from local dialects, and technical terms. Apollonius the Sophist (fl. 1st century CE) wrote the oldest surviving Homeric lexicon. The first Sanskrit dictionary, the Amarakośa, was written by Amara Sinha c. 4th century CE. Written in verse, it listed around 10,000 words. According to the Nihon Shoki, the first Japanese dictionary was the long-lost 682 CE Niina glossary of Chinese characters. The oldest existing Japanese dictionary, the c. 835 CE Tenrei Banshō Meigi, was also a glossary of written Chinese. A 9th-century CE Irish dictionary, Sanas Cormaic, contained etymologies and explanations of over 1,400 Irish words. In India around 1320, Amir Khusro compliled the Khaliq-e-bari which mainly dealt with Hindvi and Persian words. The French-language Petit Larousse is an example of an illustrated dictionary. Arabic dictionaries were compiled between the 8th and 14th centuries CE, organizing words in rhyme order (by the last syllable), by alphabetical order of the radicals, or according to the alphabetical order of the first letter (the system used in modern European language dictionaries). The modern system was mainly used in specialist dictionaries, such as those of terms from the Qur'an and hadith, while most general use dictionaries, such as the Lisan al-`Arab (13th century, still the best-known large-scale dictionary of Arabic) and al-Qamus al-Muhit (14th century) listed words in the alphabetical order of the radicals. The Qamus al-Muhit is the first handy dictionary in Arabic, which includes only words and their definitions, eliminating the supporting examples used in such dictionaries as the Lisan and the Oxford English Dictionary. In medieval Europe, glossaries with equivalents for Latin words in vernacular or simpler Latin were in use (e.g. the Leiden Glossary). The Catholicon (1287) by Johannes Balbus, a large grammatical work with an alphabetical lexicon, was widely adopted. It served as the basis for several bilingual dictionaries and was one of the earliest books (in 1460) to be printed. In 1502 Ambrogio Calepino's Dictionarium was published, originally a monolingual Latin dictionary, which over the course of the 16th century was enlarged to become a multilingual glossary. In 1532 Robert Estienne published the Thesaurus linguae latinae and in 1572 his son Henri Estienne published the Thesaurus linguae graecae, which served up to the 19th century as the basis of Greek lexicography. The first monolingual dictionary written in Europe was the Spanish, written by Sebastián Covarrubias' Tesoro de la lengua castellana o española, published in 1611 in Madrid, Spain. In 1612 the first edition of the Vocabolario dell'Accademia della Crusca, for Italian, was published. It served as the model for similar works in French and English. In 1690 in Rotterdam was published, posthumously, the Dictionnaire Universel by Antoine Furetière for French. In 1694 appeared the first edition of the Dictionnaire de l'Académie française. Between 1712 and 1721 was published the Vocabulario portughez e latino written by Raphael Bluteau. The Real Academia Española published the first edition of the Diccionario de la lengua española in 1780, but their Diccionario de Autoridades, which included quotes taken from literary works, was published in 1726. The Totius Latinitatis lexicon by Egidio Forcellini was firstly published in 1777; it has formed the basis of all similar works that have since been published. The first edition of A Greek-English Lexicon by Henry George Liddell and Robert Scott appeared in 1843; this work remained the basic dictionary of Greek until the end of the 20th century. And in 1858 was published the first volume of the Deutsches Wörterbuch by the Brothers Grimm; the work was completed in 1961. Between 1861 and 1874 was published the Dizionario della lingua italiana by Niccolò Tommaseo. Émile Littré published the Dictionnaire de la langue française between 1863 and 1872. In the same year 1863 appeared the first volume of the Woordenboek der Nederlandsche Taal which was completed in 1998. Also in 1863 Vladimir Ivanovich Dahl published the Explanatory Dictionary of the Living Great Russian Language. The Duden dictionary dates back to 1880, and is currently the prescriptive source for the spelling of German. The decision to start work on the Svenska Akademiens ordbok was taken in 1787. The earliest dictionaries in the English language were glossaries of French, Spanish or Latin words along with their definitions in English. The word "dictionary" was invented by an Englishman called John of Garland in 1220 — he had written a book Dictionarius to help with Latin "diction". An early non-alphabetical list of 8000 English words was the Elementarie, created by Richard Mulcaster in 1582. In 1616, John Bullokar described the history of the dictionary with his "English Expositor". Glossographia by Thomas Blount, published in 1656, contains more than 10,000 words along with their etymologies or histories. Edward Phillips wrote another dictionary in 1658, entitled "The New World of English Words: Or a General Dictionary" which boldly plagiarized Blount's work, and the two renounced each other. This created more interest in the dictionaries. John Wilkins' 1668 essay on philosophical language contains a list of 11,500 words with careful distinctions, compiled by William Lloyd. Elisha Coles published his "English Dictionary" in 1676. It was not until Samuel Johnson's A Dictionary of the English Language (1755) that a more reliable English dictionary was produced. Many people today mistakenly believe that Johnson wrote the first English dictionary: a testimony to this legacy. By this stage, dictionaries had evolved to contain textual references for most words, and were arranged alphabetically, rather than by topic (a previously popular form of arrangement, which meant all animals would be grouped together, etc.). Johnson's masterwork could be judged as the first to bring all these elements together, creating the first "modern" dictionary. Johnson's dictionary remained the English-language standard for over 150 years, until the Oxford University Press began writing and releasing the Oxford English Dictionary in short fascicles from 1884 onwards. It took nearly 50 years to complete this huge work, and they finally released the complete OED in twelve volumes in 1928. It remains the most comprehensive and trusted English language dictionary to this day, with revisions and updates added by a dedicated team every three months. One of the main contributors to this modern dictionary was an ex-army surgeon, William Chester Minor, a convicted murderer who was confined to an asylum for the criminally insane. In 1806, American Noah Webster published his first dictionary, A Compendious Dictionary of the English Language. In 1807 Webster began compiling an expanded and fully comprehensive dictionary, An American Dictionary of the English Language; it took twenty-seven years to complete. To evaluate the etymology of words, Webster learned twenty-six languages, including Old English (Anglo-Saxon), German, Greek, Latin, Italian, Spanish, French, Hebrew, Arabic, and Sanskrit. Webster completed his dictionary during his year abroad in 1825 in Paris, France, and at the University of Cambridge. His book contained seventy thousand words, of which twelve thousand had never appeared in a published dictionary before. As a spelling reformer, Webster believed that English spelling rules were unnecessarily complex, so his dictionary introduced American English spellings, replacing "colour" with "color", substituting "wagon" for "waggon", and printing "center" instead of "centre". He also added American words, like "skunk" and "squash", that did not appear in British dictionaries. At the age of seventy, Webster published his dictionary in 1828; it sold 2500 copies. In 1840, the second edition was published in two volumes. Austin (2005) explores the intersection of lexicographical and poetic practices in American literature, and attempts to map out a "lexical poetics" using Webster's definitions as his base. He explores how American poets used Webster's dictionaries, often drawing upon his lexicography in order to express their word play. Austin explicates key definitions from both the Compendious (1806) and American (1828) dictionaries, and brings into its discourse a range of concerns, including the politics of American English, the question of national identity and culture in the early moments of American independence, and the poetics of citation and of definition. Austin concludes that Webster's dictionaries helped redefine Americanism in an era of an emergent and unstable American political and cultural identity. Webster himself saw the dictionaries as a nationalizing device to separate America from Britain, calling his project a "federal language", with competing forces towards regularity on the one hand and innovation on the other. Austin suggests that the contradictions of Webster's lexicography were part of a larger play between liberty and order within American intellectual discourse, with some pulled toward Europe and the past, and others pulled toward America and the new future. In a general dictionary, each word may have multiple meanings. Some dictionaries include each separate meaning in the order of most common usage while others list definitions in historical order, with the oldest usage first. In many languages, words can appear in many different forms, but only the undeclined or unconjugated form appears as the headword in most dictionaries. Dictionaries are most commonly found in the form of a book, but some newer dictionaries, like StarDict and the New Oxford American Dictionary are dictionary software running on PDAs or computers. There are also many online dictionaries accessible via the Internet. According to the Manual of Specialized Lexicographies a specialized dictionary (also referred to as a technical dictionary) is a dictionary that focuses upon a specific subject field. Following the description in The Bilingual LSP Dictionary, lexicographers categorize specialized dictionaries into three types. A multi-field dictionary broadly covers several subject fields (e.g. a business dictionary), a single-field dictionary narrowly covers one particular subject field (e.g. law), and a sub-field dictionary covers a more specialised field (e.g. constitutional law). For example, the 23-language Inter-Active Terminology for Europe is a multi-field dictionary, the American National Biography is a single-field, and the African American National Biography Project is a sub-field dictionary. In terms of the above coverage distinction between "minimizing dictionaries" and "maximizing dictionaries", multi-field dictionaries tend to minimize coverage across subject fields (for instance, Oxford Dictionary of World Religions and Yadgar Dictionary of Computer and Internet Terms) whereas single-field and sub-field dictionaries tend to maximize coverage within a limited subject field (The Oxford Dictionary of English Etymology). A 'phonetic dictionary is one] that allows the reader to locate words by the "way they sound", i.e. a dictionary that matches common or phonetic misspellings with the correct spelling of a word; such a dictionary uses pronunciation respelling to aid the search for or recognition of a word, and differs from a pronouncing dictionary, such as the CMU Pronouncing Dictionary, which maps from a written word to its pronunciation in a chosen dialect. Another variant is the glossary, an alphabetical list of defined terms in a specialised field, such as medicine (medical dictionary). The simplest dictionary, a defining dictionary, provides a core glossary of the simplest meanings of the simplest concepts. From these, other concepts can be explained and defined, in particular for those who are first learning a language. In English, the commercial defining dictionaries typically include only one or two meanings of under 2000 words. With these, the rest of English, and even the 4000 most common English idioms and metaphors, can be defined. 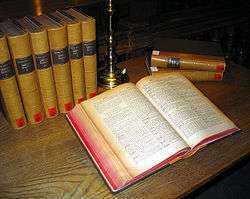 Large 20th-century dictionaries such as the Oxford English Dictionary (OED) and Webster's Third are descriptive, and attempt to describe the actual use of words. Most dictionaries of English now apply the descriptive method to a word's definition, and then, outside of the definition itself, add information alerting readers to attitudes which may influence their choices on words often considered vulgar, offensive, erroneous, or easily confused. Merriam-Webster is subtle, only adding italicized notations such as, sometimes offensive or nonstand (nonstandard). American Heritage goes further, discussing issues separately in numerous "usage notes." Encarta provides similar notes, but is more prescriptive, offering warnings and admonitions against the use of certain words considered by many to be offensive or illiterate, such as, "an offensive term for..." or "a taboo term meaning...". Because of the widespread use of dictionaries in schools, and their acceptance by many as language authorities, their treatment of the language does affect usage to some degree, with even the most descriptive dictionaries providing conservative continuity. In the long run, however, the meanings of words in English are primarily determined by usage, and the language is being changed and created every day. As Jorge Luis Borges says in the prologue to "El otro, el mismo": "It is often forgotten that (dictionaries) are artificial repositories, put together well after the languages they define. The roots of language are irrational and of a magical nature." Sometimes the same dictionary can be descriptive in some domains and prescriptive in others. For example, according to Ghil'ad Zuckermann, the Oxford English-Hebrew Dictionary is "at war with itself": whereas its coverage (lexical items) and glosses (definitions) are descriptive and colloquial, its vocalization is prescriptive. This internal conflict results in absurd sentences such as hi taharóg otí kshetiré me asíti lamkhonít (she'll tear me apart when she sees what I've done to the car). Whereas hi taharóg otí, literally 'she will kill me', is colloquial, me (a variant of ma 'what') is archaic, resulting in a combination that is unutterable in real life. In contrast to traditional dictionaries, which are designed to be used by human beings, dictionaries for natural language processing (NLP) are built to be used by computer programs. The final user is a human being but the direct user is a program. Such a dictionary does not need to be able to be printed on paper. The structure of the content is not linear, ordered entry by entry but has the form of a complex network (see Diathesis alternation). Because most of these dictionaries are used to control machine translations or cross-lingual information retrieval (CLIR) the content is usually multilingual and usually of huge size. In order to allow formalized exchange and merging of dictionaries, an ISO standard called Lexical Markup Framework (LMF) has been defined and used among the industrial and academic community. In many languages, such as the English language, the pronunciation of some words is not apparent from their spelling. In these languages, dictionaries usually provide the pronunciation. For example, the definition for the word dictionary might be followed by the International Phonetic Alphabet spelling /ˈdɪkʃənɛri/. American English dictionaries often use their own pronunciation spelling systems, for example dictionary dĭkʹ·shə·nār·ē. The IPA is more commonly used within the British Commonwealth countries. Yet others use a pronunciation respelling system: for example, dictionary may respelled DIK-shə-nair-ee. Some online or electronic dictionaries provide audio recordings of words being spoken. The age of the Internet brought online dictionaries to the desktop and, more recently, to the smart phone. David Skinner in 2013 noted that, "Among the top ten lookups on Merriam-Webster Online at this moment are 'holistic, pragmatic, caveat, esoteric' and 'bourgeois.' Teaching users about words they don’t already know has been, historically, an aim of lexicography, and modern dictionaries do this well." ↑ Nielsen, Sandro (2008). "The Effect of Lexicographical Information Costs on Dictionary Making and Use". Lexikos. 18: 170–189. ISSN 1684-4904. ↑ R. R. K. Hartmann (2003). Lexicography: Dictionaries, compilers, critics, and users. Routledge. p. 21. ISBN 978-0-415-25366-6. 1 2 Dictionary – MSN Encarta. Archived from the original on 2009-10-31. ↑ Peter Bing (2003). "The unruly tongue: Philitas of Cos as scholar and poet". Classical Philology. 98 (4): 330–348. doi:10.1086/422370. ↑ Rashid, Omar. "Chasing Khusro". The Hindu. Retrieved 5 August 2012. ↑ Tesoro de la lengua castellana o española, edición integral e ilustrada de Ignacio Arellano y Rafael Zafra, Madrid, Iberoamericana-Vervuert, 2006, pg. XLIX. ↑ A Brief History of English Lexicography, Peter Erdmann and See-Young Cho, Technische Universität Berlin, 1999. ↑ John P. Considine (27 March 2008). Dictionaries in Early Modern Europe: Lexicography and the Making of Heritage. Cambridge University Press. p. 298. ISBN 978-0-521-88674-1. Retrieved 16 May 2016. 1 2 Lynch, "How Johnson's Dictionary Became the First Dictionary"
↑ Simon Winchester, The Surgeon of Crowthorne. ↑ Phil Benson (2002). Ethnocentrism and the English Dictionary. Taylor & Francis. pp. 8–11. ↑ Ingrid Tieken-Boon van Ostade; Wim van der Wurff (2009). Current Issues in Late Modern English. Peter Lang. pp. 41–42. ↑ Zuckermann, Ghil'ad (1999). Review of the Oxford English-Hebrew Dictionary, International Journal of Lexicography 12.4, pp. 325-346. ↑ David Skinner, The Role of a Dictionary in "Opinionator: Exclusive Online Commentary from the Times", The New York Times, May 17, 2013. Bergenholtz, Henning; Tarp, Sven, eds. (1995). Manual of Specialised Lexicography: The Preparation of Specialised Dictionaries. Amsterdam: John Benjamins Publishing. ISBN 90-272-1612-6. Erdmann, Peter; Cho, See-Young. "A Brief History of English Lexicography". Technische Universität Berlin. Archived from the original on 9 March 2008. Retrieved 17 December 2010. Landau, Sidney I. (2001) . Dictionaries: The Art and Craft of Lexicography (2nd ed.). Cambridge: Cambridge University Press. ISBN 0-521-78040-3. Nielsen, Sandro (1994). The Bilingual LSP Dictionary: Principles and Practice for Legal Language. Tübingeb: Gunter Narr. ISBN 3-8233-4533-8. Nielsen, Sandro (2008). "The Effect of Lexicographical Information Costs on Dictionary Making and Use". Lexikos. 18: 170–189. ISSN 1684-4904. Winchester, Simon (1998). The Professor and the Madman: A Tale of Murder, Insanity, and the Making of the Oxford English Dictionary. New York: HarperPerennial. ISBN 0-06-099486-X. (published in the UK as The Surgeon of Crowthorne). P. G. J. van Sterkenburg, ed. (2003). A practical guide to lexicography. John Benjamins Publishing Company. ISBN 978-1-58811-381-8. Guy Jean Forgue, "The Norm in American English," Revue Francaise d'Etudes Americaines, Nov 1983, Vol. 8 Issue 18, pp 451–461. An international appreciation of the importance of Webster's dictionaries in setting the norms of the English language. Look up dictionary or wordbook in Wiktionary, the free dictionary. "Dictionary". Collier's New Encyclopedia. 1921. "Dictionary". Encyclopædia Britannica (11th ed.). 1911. "Dictionary". New International Encyclopedia. 1905.